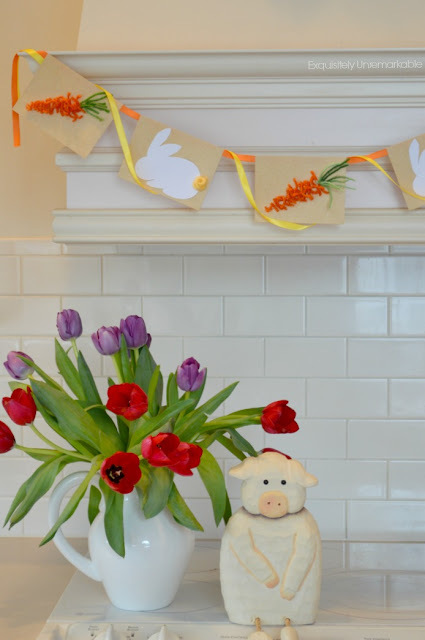 Whip up a sweet bunny banner for spring , Easter or baby's nursery in no time flat. Come see the quick how to! Ever lose track of time in the fabric store? Wander aimlessly up and down the aisles, gazing at the floor to ceiling rolls of color and pattern, gathering samples that do not match your decor and dream about the ways you could use them...even though they're not even remotely red? Clearly, I have a problem. I am a complete and total fabric junkie. Perfect example, even though there is absolutely no place in my home where this gorgeous blue would go, I could not be coaxed out of the store without a small piece of it. You know...in case. 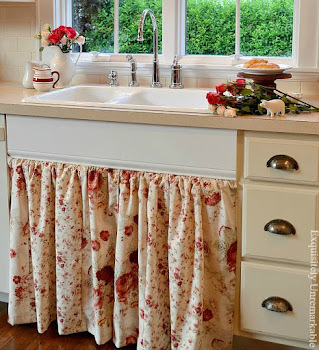 It's been in my fabric scrap bucket for years and every now and then I pick it up and drape it around the house, thinking that this time, I just might find a place for it...and you know what? Today was that day. I took one look at it and immediately thought bunny banner. I guess I had bunnies and banners on the brain after my last piece. Plus it's been a while since I made a banner, so I figured why not. It was super easy to do, start to finish, less than ten minutes. I already had the burlap banner hanging on mantle. So all I needed to do was grab my bunny template and start cutting. Well, I didn't really just start cutting. What I did was fold my fabric on itself a few times, trace the bunny with a pencil on the back of the fabric and then I started cutting. They were a little wrinkled, which is understandable, I mean that fabric was in the bucket for a long time. So I grabbed my iron and smoothed them out. Of course, every bunny needs a tail and I was going to go with the traditional cotton style, but then these buttons caught my eye and I thought, why not. A little hot glue was all it took to affix them and voilá...button tail bunnies. 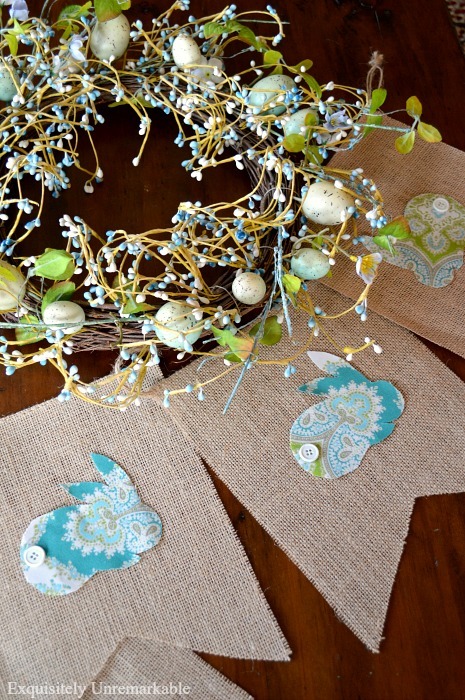 Now, since I like to reuse the burlap banner each season (storage is sorely lacking in this tiny cottage) I just used a small pin to attach the bunnies to the banner. 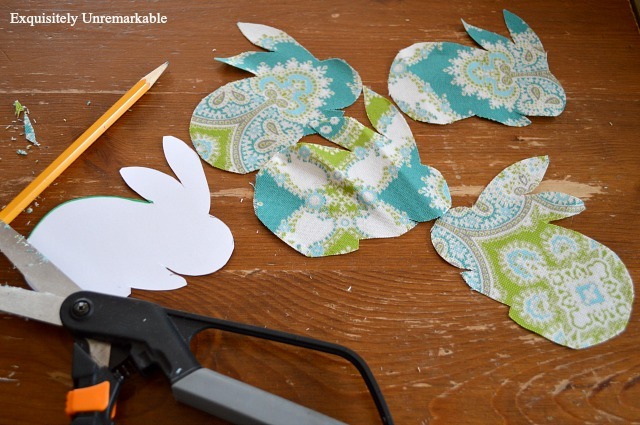 You can hot glue them or stitch them on, if you prefer, for a more permanent fix. I'm just not a permanent kind of gal. When I hung them up I was actually surprised at how well they went with all the red in the room. It was kind of shocking. It got me thinking about all the other samples I have in that fabric scrap bucket ~ pinks, purples, yellows, more blues ~ and how they may look just as good as with my red. As a matter of fact, I have so many great ideas, I'm starting to think that I may need more samples. Do you have a fabric addiction? 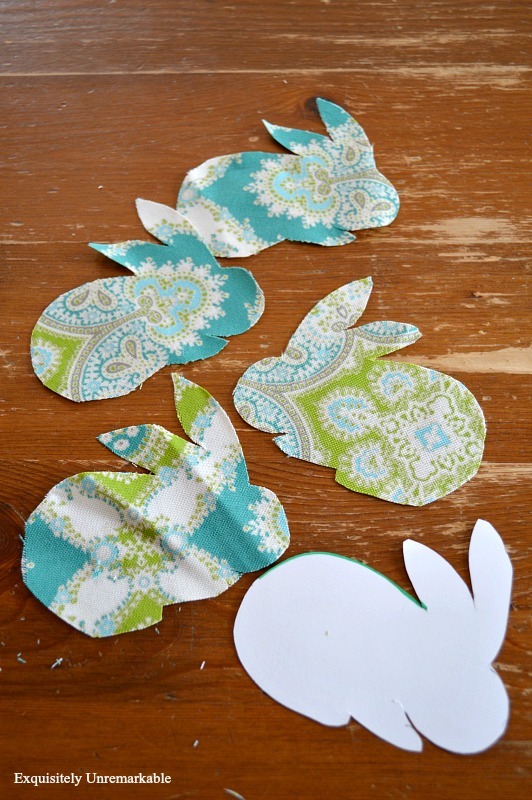 This is such a great idea and your bunnies are so adorable! I think I might try it, thank you for the wonderful kick in the pants... I mean inspiration lol. Haha...yes, sometimes I need that same kick, Linda! ;) So glad you enjoyed this project. Happy weekend! You are the resident banner maker! There was a time when I haunted the fabric shops because I loved to sew and quilt. But can't do that anymore due to ankle and hand arthritis. Have a great weekend! Aren't you all pretty and "Banner Bunnified!" Sweet it is . . . bring on some April Color! What a cute banner! Now I want to make one! 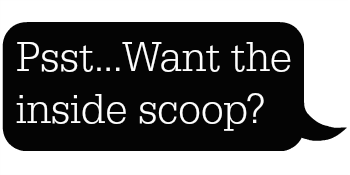 I am so lazy that I would probably just order the burlap banner from the links at the end of your post. I am a fabric hoarder with absolutely nothing to do with it. I have two packs of designer fabric samples that I use occasionally, but clearly I have more than I need. Ann Marie, I am super lazy!! That banner is from the store. I just recycled it from Christmas...swapped out the snowflakes and added the bunnies! ;) I do however have more than enough fabric to make my own if I were ever motivated to do so, but I doubt that is ever going to happen! Hi, thanks for sharing such an adorable project, your banner looks awesome! Wondering if I could ask you where you got the wreath displayed in the photo with the banner? I just love it! Thank you! I am so glad! Good luck, I bet it's going to be beautiful! Very cute! I have a bunny/easter egg banner hanging over my entertainment center made from "paint samples" and scrapbook paper, and another bunny banner (back side only w/cotton tails) hanging in my dining room window. 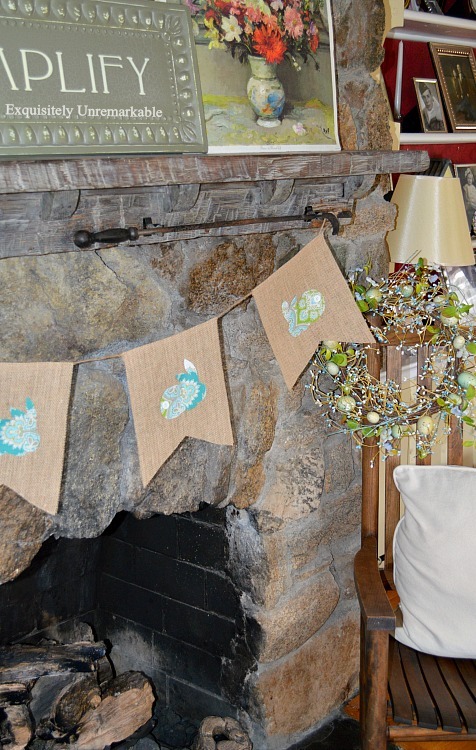 The banners are such a cute, inexpensive way to brighten the house for the holidays. Thanks for sharing your ideas! These are so cute and the pattern makes them all look different but cohesive. The buttons for the tail is awesome! I have a ton of buttons here and there too, what a great idea! I did have a fabric addiction, but I whittling it down. The last little lap quilt I made with completely with left over fabrics. Hi Kim, Your banner is adorable. Love it and the fabric you used. Such sweet details make it so cute! Yes, I too have a fabric addiction and recently had to purchase totes to hold it all in a more organized way. Fabric shops, along with yarn shops, are known worldwide as time-sucking vortex. In some countries they come with their own warning. Love the banner! Thanks Amalia and yes…we should have that warning here! ;) ps- I can’t help thinking that these bunnies are calling out for a story. Your creative blogging influence no doubt. Your banner is darling. So cute and nice that you are able to reuse it for different seasons. That is so clever. I have a fabric stash...I guess it would qualify as an addiction. I had decided to make a paper banner for my mom for Easter. I don't know if I can make it changeable like yours but I now am considering at least making it reversible. We will see if I get it done. Hope you are having a good weekend. Thank you, Lorri and I LOVE your reversible idea. I am all about that kind of changeable craft. Now you have me thinking of one…spring blooms on one side and summer ones on the other! So beautiful...what a lovely idea!! Yup, I'm addicted to fabric stores too. Even went to one here in Asheville the other day. I think my addiction can beat up your addiction ;). 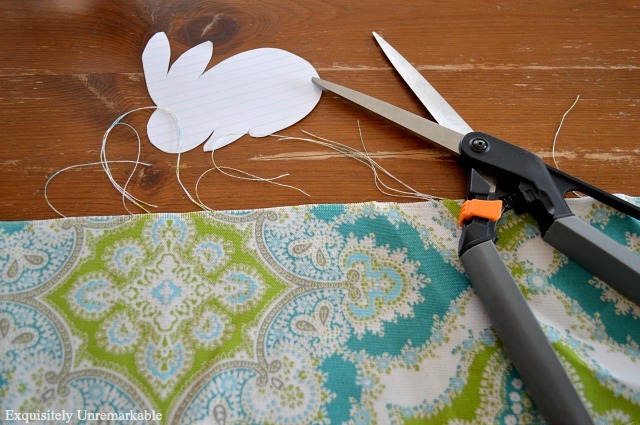 Cute banner and a great way to use that pretty fabric. I do like the color choice, blue is my favorite color. The sweet button tail is Hip-pity Hop-pity perfect. I love fabric! I just don't buy it anymore, because it turns into a sickness and I don't have the room either. Yes mam, I definitely have a fabric addiction & actually sew very little. But you can use it for lots of things, right? I'd say so. I've done exactly the same...buy something I like knowing it doesn't go with anything I have, but I like it! Almost can't resist fabric at yard sales! Like your bunny banner too, especially the button tail...different! I do have a fabric addiction, and it is very frustrating since I don't sew! Now, if I did sew, I'd probably have it under better control. Your blue bunny banner is beautiful. I actually consider blue to be a neutral hue, so in my book, it goes with everything! Yes, I share your addiction, Kim! I love wandering aimlessly, imagining what I could make. Though I often enter without a project in mind, I never leave empty handed. And, I never tire of looking at my little piles of fabric stacked on shelves in my craft space. Those are the cutest little button tailed bunnies! I can see why you didn't give up on that fabric. Glad you found a way to incorporate it into your home. I think it goes really well with red too! Hi Kim, I wanted to stop by to tell you how much I appreciate your prayers for my surgery last Monday. Diana posted a prayer request on her blog and I am full of gratitude! I am slowly recovering but wanted you to know how very much I appreciate you thinking of me. :-) This is an adorable craft! Looking forward to following your blog and getting to know you better. Have a great week! Thanks so much, Jill. I am so glad that you are feeling better. I really appreciate the visit. It was so sweet of you to come by and say hello. 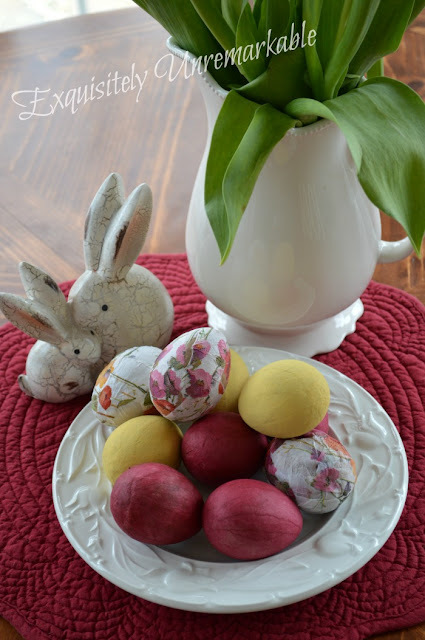 I wish you a great week and a Happy, Healthy Easter! Fabric doesn't do anything for me, but I know you're not alone in your addiction, because I have friends that are the same way! Though I have to say, I do love the fabric you picked out for your bunnies. ;-) And the banner you made is adorable! Thanks Melanie. Yes, it's a sickness...even when I have no idea what I would do with it, I have to have it. ;) Glad to hear I am not alone. Kim, I love that fabric! I actually love aqua with red and a touch of green. After all, that's what I have in my kitchen. :) The buttons are the cutest little bunny tails! I love the look of aqua and red together, Jann. I might have to add more…and not all in bunny form! ;) Happy Easter my friend. Hi Kim, oh wow I LOVE your bunny banner you made and the colors of it too. Thanks for the tutorial on how to make it. I am pinning this one. 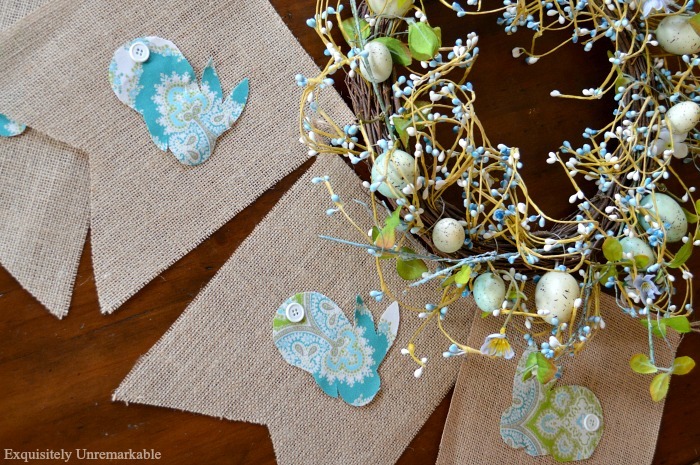 This is such a pretty idea for Easter, love the blues! Love that you recycle everything! Thanks Maria...I have to admit, I love this one!